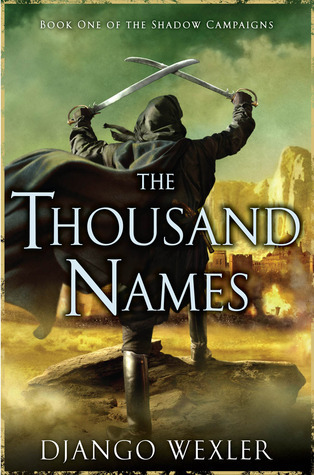 The Book Tart Quickie Ten with Django Wexler + Spotlight on The Thousand Names + Contest! Yay! My Baron of Books has been telling me for a while how much he loved Django Wexler’s The Thousand Names and I finally arranged a playdate with Django. His flintlock fantasy story is on my TBR mountain even more after reading The Barons review. 😉 Click HERE to see why. Django is a darlin’ and plays well with my brand of crazy. 😛 Enjoy the silly and make sure to enter my giveaway too. Django: If there’s one thing I like, its couches. And hot chocolate. That may be two things. Django: I hope you enjoy it! Basically, I really liked what George R. R. Martin did in A Song of Ice and Fire, bringing a more grounded, historical context to fantasy, so I decided I wanted to do something like that. But that meant looking a bit farther afield for a setting, since the traditional fantasy knights-and-castles world has been pretty well covered now. I was reading about the campaigns of Napoleon at the time, and I thought would make a really excellent model. The original draft of The Shadow Campaigns storyline was basically just a fantasy retelling of the Napoleonic Wars. As I went on I put a lot more fantasy into it, so it veered off in new directions. (Which I’m really happy about!) But the setting and the military focus comes from its origin as a Napoleonic story. Me: Have you been to any conventions that you get to dress up in costume? I love dressing up! I went to Dragon Con a few years ago and our group dressed as the groupies for Captain Hammer (The Baron of Books dressed as Captain Hammer lol) Sooo do you dress up? Django: Not often, I have to say. I’m not very handy with crafts and such, so I only really do that sort of thing when someone else is making the props or costumes. One of my friends had a cosplay wedding, which I went to with a sword and a black leather trenchcoat, but that’s about as close as I come. Seeing the awesome costumes is one of my favorite parts of going to cons, though! This year I was at NY and San Diego Comic Cons, and there were tons of amazing people. Me: Fun! Fun! Fun!!! I so want to go to one of the Comic Cons. And a cosplay wedding? *sigh* Nice! *munches popcorn and passes bowl to Django* Are you at all ready for the holidays? I’m not! Do you decorate and do your cats knock down the ornaments? Django: Om nom nom. Getting there. I have some edits I need to turn in before I go on vacation, so I’m working hard to get through those! Once that’s done, I’ll be ready. Holidays are actually the loneliest time of the year for the cats. I usually go back to NY, where I grew up, to spend the season with family, so friends here have to come over and make sure the kitties are fed and watered. I don’t do much decoration here, but back in NY there’s always a big tree and other fun stuff. Me: I’m so glad you get to visit family! I just came back from Thanksgiving with family and it was so wonderful. Django: You’re both in luck! 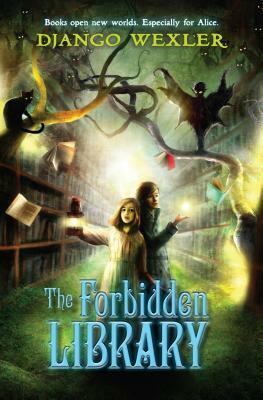 So, in April, The Forbidden Library comes out. 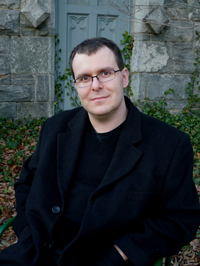 It’s a middle-grade fantasy about a girl who is sent to live with her strange uncle after her father disappears. She sneaks into his library and finds out that she has the power to use the magical books inside, and then gets into a lot of trouble! There’s also talking cats. 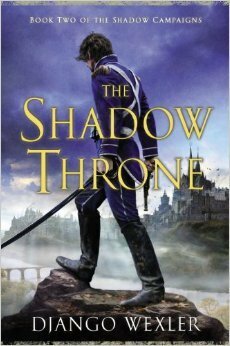 The sequel to The Thousand Names is The Shadow Throne, and it comes out in July. It’s getting close to done, there’s probably a couple of rounds of editing left. In between rounds of that, I’m working on editing the sequel to The Forbidden Library, which doesn’t have a final title yet, but I’m already really excited about! 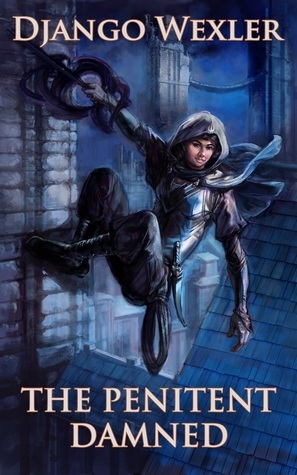 After that, it’s on to book three of The Shadow Campaigns for 2015. Lots to keep me busy! Two. (One for kicking on and off, one for jogging.) Also a pair of fuzzy slippers I wear everywhere, I have cold feet. Right now … ketchup, relish, lots of olives, maraschino cherries (which one of my friends just eats straight from the bottle) and butter. I’d like to be able to teleport from place to place, so I could zip to other cities for visits without flying. Also maybe time travel, there’s some stuff I’d really like to find out about history. Hmm, judging by the above, apparently Dr. Who. Or possibly Dr. Whom. Tough one. I love the original Star Wars trilogy and a few of the books, but all the awful stuff they’ve done later on makes it hard for me to say it’s really my favorite. Then again, I’m not fond of the latest Star Trek either, so maybe it’s a tie. I like the fish and whatnot in aquariums. Zoos always make me feel a little guilty, because the animals are stuck in there, but fish don’t know any better. I always like the weird-looking jellyfish and other oddities. Also, red pandas, because they’re like big, fuzzy cats! Seriously, why can’t we have those as pets? Get on it, Science! I’ve had a pretty basic haircut all my life, just the generic “pretty short”. If I go too long without getting it cut it turns into a sort of proto-afro, so I’m never tempted to try anything complicated. Not that I remember. As an adult, I put a coat hook on the back of my bedroom door, and discovered the next night that with the light at a certain angle my coat looks like Slenderman. Yeesh! Yes, but not terribly well anymore. I was in clubs around middle school, but I got distracted after that with more nerdy stuff like Magic: The Gathering, D&D, and so on. These days I play Go, at which I’m reasonably competent on a good day. Clementines! It’s clementine season right now and I eat like a dozen of them every day. My favorite fruit is cherries. My fav fruit is cantaloupe and I have no idea how many shoes I have! Not under the bed or in a cupboard. I was afraid of small people who darted from place to place whenever I wasn’t looking.